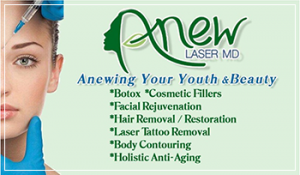 Call, Email, or Schedule Online Today, and Let Us “Anew Your Youth and Beauty! Anew Laser, M.D. offers innovative, advanced procedures using state-of-the-art Laser Technology to allow healing from within, and beautify from without!